Video demo: W.A.Mozart. Eine kleine Nachtmusik KV 525. Part I. Video demo: Johannes Brahms. Hungarian Dance No. 5. Arranged for bayan (accordion) by Anatoly Martsenyuk. Video demo: Frédéric Chopin. Waltz No. 7 in C Sharp Minor, Op. 64 No. 2. Arranged for bayan (accordion) by Anatoly Martsenyuk. Video demo: Vittorio Monti. Czardas (Chardash. 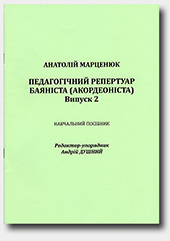 Arranged for bayan (accordion) by Anatoly Martsenyuk.